In case you missed it, I started a new series called Weekly Workouts that is explained here. I have to say that this workout plan has worked out (no pun intended) so much better than I thought. I have really enjoyed working out, which isn't typically the case. And I have found working out at home so convenient. It is easier to squeeze in on the nights that Butter Bean goes to bed early or first thing in the morning when I know we'll have a busy day. Here's this week's recap! Sunday: Death by Burpees score 7+7 I thought this was pretty good start. I wasn't expecting to make it through the seventh minute, so that was a nice surprise. I'm really hoping next week's score starts with an 8! Monday: Fit in the workout in the evening after Butter Bean went to bed. I quickly realized that 10 rounds wasn't going to happen for me. So as the video indicated, I started at the fifth round and was struggling by the end. Tuesday: I was so incredibly sore and we had a house guest arriving, so I decided to take the day off. Wednesday: I knew this would be a busy day with a crazy day at work and then heading out to our favorite sushi place with our house guest. So I got up early and worked out first thing. Getting up was a little rough, but I felt so accomplished all day to know that my workout was out of the way. I decided to push myself and started at round 6. I'm happy with this decision. I struggled, but I made it! Thursday: Another rest day because I needed it mentally and physically. Friday: My plan is to workout on my lunch break since I'll be working from home and can get the workout in and then squeeze in a shower. I'm really hoping that I'll be able to make it through 8 rounds. So what's the plan for next week? Death by Burpees on Sunday as usual. 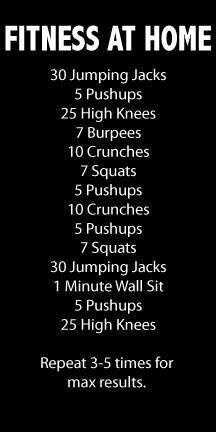 And then the following workout 3 times at some point next week. I can't find the source for this workout. If you can, please let me know so I can give the appropriate credit. How was your week? What fitness goals did you meet during this week? Was anyone able to make it through all 10 rounds of last week's Countdown Workout? What is your plan for next week?